John Rahaim, the Planning Director of San Francisco and a University of Michigan Alumnus, spoke to Master of Urban Planning students at the University of Michigan a few weeks back. The auditorium was packed with both students and faculty eager to hear what he had to say about the future of planning in San Francisco. I was particularly interested in hearing him speak because, like myself, he is from the state of Michigan, got his B.S. in Architecture at the University of Michigan and ultimately decided urban planning would better allow him to intervene and design at a range of scales. If folks hate what you did, you've done the right thing. If they like it, you've probably done it wrong. He's probably right. As a planning student, it is tough to imagine making a decision that will affect 7.2 million people- but that is something John Rahaim deals with on a daily basis within his region. So often in planning the people who you are trying to help, are the very people rallying against you. According to John Rahaim, the people of San Francisco are just as passionate about what gets built in the city as they are about the crime rate, transportation, and cost of housing. John explains that this level of involvement in the planning process often leads to a 5 year approval process for any building to be realized. This citizen passion can be frustrating, but it also allows him to protect the city and ensure that as the city expands, it remains respectful to its past while also looking toward the future. Treasure Island was a former navy base intended to be San Francisco's airport. 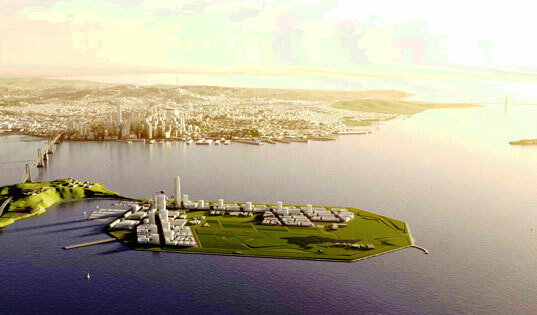 It is now planned to be a community of 7,000 housing units within walking distance of a ferry to connect to downtown. Among other things on the island, there will be schools, shops, a church, ample park space, and a working farm. Density is the driving factor that makes this site work. Since there is no public subsidy of tax dollars, the city is relying on density to propel development and generate the funds to build and sustain the development. Hunters Point was previously the largest military shipyard on the west coast employing over 25,000 people, but has now been vacant for over 30 years. Within this development there will be 12,000 housing units, 3 million square feet of R&D space, regional shopping, and park space. The best part? 30% of this housing will be "affordable housing" meaning below market rate and within the price range for those with an income below the median income level, including those with a very low income. A top challenge for the city of San Francisco (and to an extent the region) is the issue of affordability. Due to the high costs of living within San Francisco, many people are forced to live outside the limits and commute in for work and entertainment. This "pricing-out" of those with a lower income severely inhibits the potential for a diverse city. Another challenge the city faces is the lack of regional cooperation. This issue is evident for anyone who has attempted to travel using the 27 individual transit systems within the region. Yes, twenty-seven different transit systems. While I would appreciate more transit options within Metro Detroit, there is definitely a balance to strike between what we lack and the overabundance of options San Francisco is trying to maintain. New growth must be transit based. We need to use development to create social equity. None of these are that far out there, but will require a conscious effort on the part of the planner to ensure these actions are kept in mind as we move forward. California is under a lot of pressure to reduce carbon emissions generated from automobile traffic -among other sources- so improving transportation infrastructure has taken the front seat for many communities. It makes sense to focus on transit, and it definitely makes sense to do so at a regional level. If someone can get around San Francisco, but cannot easily get out of the city, the city's potential is being physically and economically limited. For San Francisco, a clear first step would be to consolidate the 27 different transit systems within the region into one cohesive system. Creating a single system would then simplify the connection of the Bay Area to other regions in California. This would provide citizens with more sustainable travel alternatives for both short commutes and weekend getaways. To tie in his third point of social equity, by developing these transit systems as well as the affordable housing projects mentioned earlier around them, those with lower incomes (recent graduates!) with much to offer the city will have a better chance at being able to afford to live in the city.